Massive and deadly subduction earthquake, registered as M 8.0 (USGS/EMSC), hit Santa Cruz Islands at 01:12 UTC on February 6, 2013. The epicenter was located at coordinates 10.752°S, 165.089°E, about 81 km (50 miles) W of Lata, Solomon Islands at depth of 5.8 km (3.6 miles) (poorly constrained). Depth was later revised to 28.7 km by USGS. EMSC is reporting magnitude 7.9 and depth of 20 km. Numerous extremely strong aftershocks continued days after the 8.0 earthquake. Full list of aftershocks and world earthquakes since February 6 can be found at the end of the article. The image below shows the focal mechanisms of the many earthquakes. Some are mainly subduction earthquakes, other are transform quakes. The different signs in the indicate the very complex nature of this part of the world. - There is currently no power or running water in Lata. - Coastal wells have been covered by debris or contaminated, water tanks and toilets have been destroyed and the coastal areas are littered with dead fish and poultry. - In their assessment of two coastal communities in the north-east of Lata, World Vision reported that homes had shifted 5–10 metres and 90 percent had been damaged. Schools and churches have been destroyed or badly damaged. - In the area of Nela, a small village of 200 people, 95 percent of homes have been washed away. - For many families, their livelihoods also disappeared in the water, as gardens and fruit trees near the coast were destroyed while the sea is still not safe to allow fishing activities. Health services have also been disrupted by the tidal surge and patients have had to move to higher ground. - “Debris and water on the runway left behind by the tsunami at the airport in Lata have prevented aid from reaching the people most in need. - We hope to reach some of the most remote communities by boat,” said Andrew Catford, World Vision’s Country Programme Director in the Solomon Islands. “The supplies we’re bringing include tarpaulins, blankets, water containers, hygiene supplies, baby kits, emergency kits, kitchens sets and mosquito nets.” This will be used to provide immediate relief to up to 3,500 people affected. World Vision will also be providing boats and fuel to government assessment teams as they try to access the remote outer islands where the full impact of the tsunami and earthquake remains unclear. Update 16:00 UTC : Massive aftershocks are like being in the middle of a war zone. Additionally the epicenters are getting nearer to the Ndende island. Reaching the island by boat is not only a big distance which takes a lot of time, but captains do fear these mega-quakes a lot. Their boats, even big boats can land in the top of the palm trees if a big tsunami would strike. - The Australia Armed Forces have send an Hercules airplane to the Solomon islands to help them with the relief and rescue efforts. - It is currently night in the Solomon Islands. A NEW M7.0 (preliminary value) hit 13 minutes ago ! And again just south of Ndende, which means that the full shaking energy strikes the island. Update 15:19 UTC : The situation at Ndende (the tsunami island) gets more and more apocalyptic. A plane carrying the PM and the Press has refused to land on the Lata airport. The debris on the airstrip was cleared, but the pilots REFUSED to land because of the many very strong aftershocks. They told that they were not sure about the condition of the runway. The plane came from Honiara, the capital of the Solomon Islands who is located approx. 600 km to the North West of Ndende. - More than 3000 people are without shelter in the quake and tsunami-hit Santa Cruz island group in Solomon Islands, as significant aftershocks continue. - The death toll has risen to 10 with the discovery of a child’s body in a ditch near Lata airport, with at least five more people missing. - The Solomons government has declared a state of disaster with officials saying damage on the main island, Ndende, is much worse than first thought, with up to 20 villages swamped in a tsunami generated by the quake. - The premier of Temotu province, Charles Brown Beu, says the number of homeless is expected to grow as rescuers reach more remote areas. - Father Brown Beu says people fled again to higher ground after a 6.7 tremor on Friday morning, the largest following Wednesday’s 8.0-magnitude earthquake. (This was said BEFORE the latest dramatic aftershock closer to the island). - He says people need food and water, and most urgently, waterproof shelters. Update 12:13 UTC : The (relatively) nearby Tinakula volcano got stressed too after all these shakes. People at the island are reporting that they have heard loud rumblings from that direction. They have however other concerns that looking at the beauty of an erupting volcano. To many of of our readers will this page as an abstract story, but we guarantee you that what has happened since last week is enough to make a disaster movie only by replaying the real facts. NO tsunami warnings or advisories are in effect for this earthquake. - 9 people have now been confirmed killed, and many more may be missing in addition. Population estimates are very difficult on these smaller islands and thus more work is required to establish knowledge of the missing people. - The death toll is expected to rise as many others are missing, and emergency supplies cannot yet be flown into the devastated areas. - Honiara is around 1.5 days boat ride from Lata. Red Cross is currently working out shelter and water. - Quite a few animals, pigs and fish and chickens have also been killed. - Around 4500 people are in need of assistance. - 13 villages around Lata have been severely affected, and roads to the villages around Lata are covered in debris. - It has also been concerned that the water supply to Lata has become contaminated. - 700 homes have been damaged in addition to 100 collapsed homes. - Lata Airport is set to reopen tomorrow. Update 18:08 UTC : Police in the Solomon Islands report that at least six people have been killed, 3 are missing and approx. 100 homes have been destroyed at a little above sea level areas along the coast. Due to the relatively close distance to the epicenter (in the epicenter area the waves are moving at high speed) the water swell/current arrived already after approx. 5 minutes. Nearly 800 houses were inundated including the low lying airstrip at Lata. Update 12:48 UTC : The following paragraphs are from a World Vision report, a religious NGO very active in Asia and the Pacific. The report was made up before the latest casualty numbers were published. This is the most detailed report of what happened since the earthquake struck! At least 100 homes in Lata have been completely destroyed by a one meter sea surge following today’s 8.0 earthquake, according to Christian humanitarian organization World Vision. Water and electricity remain down as well. Government officials have confirmed four (in the meantime 6) deaths in the islands, and there are unconfirmed reports that some people and fishing boats may have been swept out to sea by the surge. Lata is a township in the Solomon Islands’ Temoto Province that was hardest-hit by Wednesday’s quake. The majority of Lata’s population (approximately 4,000 people) – including 20 World Vision staff members – have relocated to central Lata, 150 metres above sea level (ER : these quakes are striking since the end of last week and people do not trust it anymore – They may hold their relocation location for many days or even weeks depending on seismicity). It appears that most families living in Lata were able to relocate before the sea surge. The tsunami warning for the region has now been lifted butsignificant tremors are still being felt throughout Temotu Province. World Vision staff in Honiara were on the phone with their colleagues when the earthquake struck at approximately 12:15 p.m. Wednesday. All staff have been identified and are safe. Early reports throughout the province indicate water is still knee-deep in some areas. Lata’s local airport and four surrounding villages (total population: 800) were also flooded by the surge. Some property damage to low-lying homes is also likely. World Vision is coordinating with the Provincial Disaster Management Office, the local Red Cross, and the Temotu Provincial Authority to complete a rapid assessment of the hardest-hit regions. The initial emergency response will likely include providing clean drinking water and clothing, setting up temporary sanitation facilities, and establishing temporary shelters for families who escaped their homes. Update 10:31 UTC : 42 aftershocks of more than Magnitude 5 since the mainshock. These kind of strong continuous aftershocks are rather exceptional. Update 10:29 UTC : A lot of people are surprised that a Tsunami of “only” 1 to 1.5 meter can generate this kind of destruction. Many people are having a wrong idea of Tsunamis merely because of the drawings who can be found on the internet. They think that tsunamis have to be huge waves arriving on the coast. In most cases tsunamis are sea swelling with extremely strong currents. The swelling can go on and off for a couple of times, exactly what happened based on testimonies reported in Lata. 2 swells of 1.5 meter can be very destructive on a flat coastal strip. Update 09:29 UTC : SIBC (Solomon Islands Broadcasting Corporation) reports that up to six people have reportedly died as a result of the tsunami that struck near Temotu Province early this afternoon. Update 06:00 UTC: Unfortunately the Lata Hospital is expecting further casualties of this tsunami. They have confirmed that around 700 people live in the 3 villages destroyed but many people would have escaped. 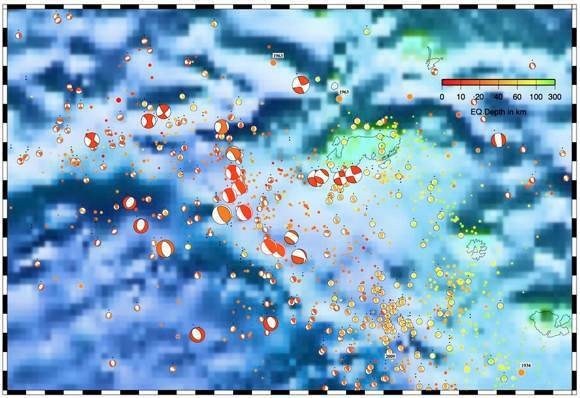 If we take the Koshimura (2006) percentages seen in Banda Aceh from the 2004 Indian Ocean Tsunami. For a 2m tsunami, the death ratio was around 0.08-0.1 thus around 60-70 deaths would be expected. For a 0.9-1.1m tsunami as reported, the death ratio was around 0.01-0.025 which would mean around 7-18 deaths are to be expected using this function. Update 05:26 UTC: At least 5 people have been killed in the tsunami. This earthquake is now CATDAT Red. Running on the trend of the tsunami in Japan – 4 of these were elderly victims (2 women, 2 men) and one was a 10-12 year old male. Update 05:15-05:30 UTC: Nendo is home to around 5000 people and from what can be gathered the destroyed villages are to the west and south of the village of Lata which would mean that around 500 people are likely affected. It is likely that they would have left to higher ground given the intensity of the earthquake, however there is still no word as to their fate. No casualties have as yet been reported. Update 04:35 UTC: Solomon authorities were telling the BBC that : The wave went 500m inland damaging 3 villages. Houses have collapsed. The messages are dripping in very slowly as all the local authorities have been running for their live uphill. ER: 500 meter inland, if true, is a huge tsunami, even at “only” 1 meter. Let us hope that most people made it uphill in time. Some older people way have had a hard time in reaching a safe higher location. Updates courtesy of Earthquake-Report: We encourage you to consider a small donation to Earthquake-Report to cover their growing expenses. Private donations are the only money they receive. An increasing number of readers has put a burden on them for more expensive servers and other expenses. If you like the way they report, please consider sending them a small donation. Remember, this is not a donation to The Watchers, it goes directly to Earthquake-Report.com - Click here to send Earthquake-Report a donation. For all current and future updates go here. After almost a week of increased seismic activity around Solomon Islands, massive M 8.0 was followed by few strong M5+ and M6+. Strong M 6.3 struck Santa Cruz Islands only hour before big quake. In following 60 minnutes after the M 8.0, islands was shaken again by M 6.4 and M 6.6 and numerous M 5+ earthquakes. The earthquakes in this area are triggered by the Australian Plate subducting the Pacific plate. Local authorities and Pacific Tsunami Warning Center issued a Regional Tsunami Warning, Watch and Advisory. There were reports of 1 meter high waves around island coastlines. Emergency authorities on Santa Cruz island have confirmed the tsunami has destroyed three villages on the island. 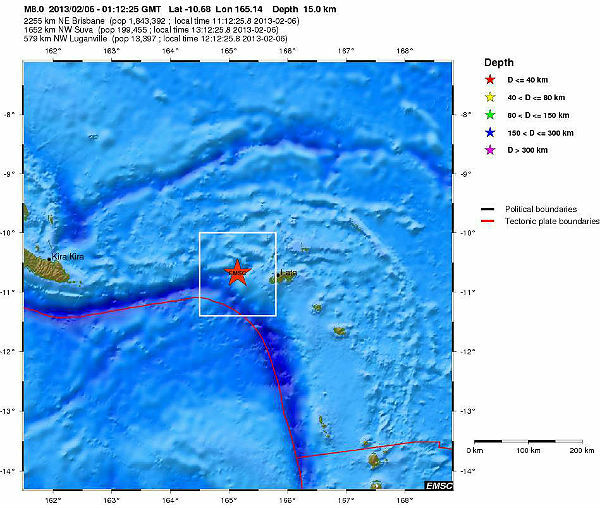 The February 6th, 2013 M 8.0 earthquake in the Santa Cruz Islands occurred as a result of shallow thrust faulting on or near the plate boundary interface between the Australia and Pacific plates. 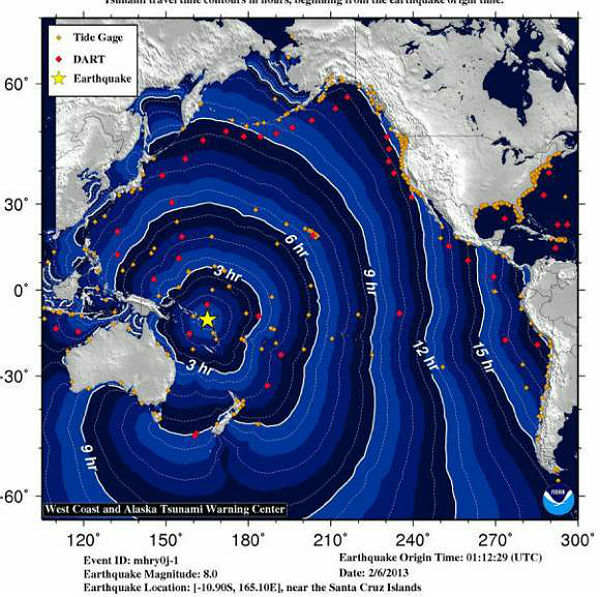 In the region of this earthquake, the Australia plate converges with and subducts beneath the Pacific plate, moving towards the east-northeast at a rate of approximately 94 mm/yr. The February 6th earthquake is located approximately 700-750 km ESE of the Mw 8.1 Solomon Islands earthquake of April 1, 2007, and the Mw 7.1 Solomon Island earthquake of January 3, 2010. 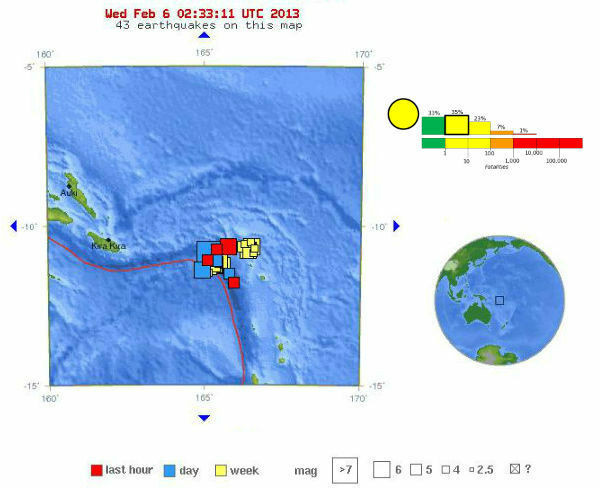 It is over 900 km to NNW of the February 2, 2012 Mw 7.1 Vanuatu earthquake, and approximately 200-300 km north of a series of earthquakes in October, 2009 along the Vanuatu Trench that included two earthquakes larger than magnitude 7 (Mw 7.8, Mw 7.4). This earthquake is located adjacent to a complex section of the Australia-Pacific plate boundary, where the Solomon Trench to the west is linked to the New Hebrides (Vanuatu) Trench to the south by a short segment of dominantly strike-slip plate motion. The February 6th earthquake is located at the northern end of the New Hebrides (Vanuatu) segment. To the north and west of this event, the plate boundary changes in character, is oriented more west-to-east, and connects the segment ruptured by this event with the continuation of the subduction zone along the Solomon Islands. Over the month leading up to the February 6th earthquake, there have been dozens of earthquakes in the epicentral region – over 40 M4.5 or larger in the preceding 7 days alone, 7 of which were larger than M6. Faulting mechanisms for these earthquakes suggest a mixture of strike-slip, normal and thrust faulting events. Within an hour of the February 6th M 8.0 mainshock, there were also two large aftershocks with magnitudes greater than M6. See a map of current aftershocks here.